View of the White Cross in the outskirts of Hereford. 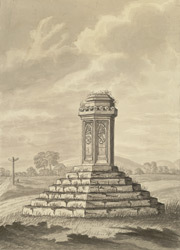 The stone monument is situated about a mile outside Hereford on the Brecon road. It was erected in 1347 by Bishop Louis Charlton between 1361-70. At this time the plague was raging through Hereford and it was necessary to hold markets outside the city, this monument marked the land on which the markets could be safely held. The original structure was a six sided panelled pedestal, elevated and resting on eight steps. In 1864 the Archdeacon Lord Saye and Sele, one of the canons of the cathedral, restored the monument and added a large stone cross to the plinth.